Raffaello Macaron Recipe - Coconut Macarons - Let the Baking Begin! Raffaello Macaron is made of a delicate Coconut Macaron shell, then filled with a delicious White Chocolate Ganache. The macaron flavors resemble those of the famous coconut candy and are always loved by anyone who tries them. Naturally gluten-free, these almond meringue cookies are dainty and delicious! Did you know that you can change the flavor of not only the filling in macarons, but of the macaron shells themselves? Following a simple ratio rule, you can make the macarons hazelnut, coconut or any other nut flavor that you wish. 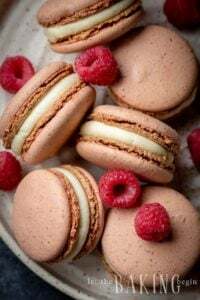 This time I will tell you how to make Coconut Flavored Macarons filled with White Chocolate Ganache, which we will call Raffaello Macarons since they so closely resemble the famous candy. How to change the flavor of the Macaron Shells? There is a reason the famous macarons are made primarily with Almond Flour – it is very low in fat content, especially compared to other nuts. It’s important when trying to play with flavors, not to ruin the fat content ratio, otherwise, we’d end up with a mess, not macarons. Keeping the Almond flour and whatever other kinds of nut flour you want to use to 50:50 ratio will allow you to change the flavor without ruining the appearance. When taking pictures, I had several different flavors of macarons, but the ones sprinkled with Desiccated Coconut and filled with white filling, are the Raffaello Macarons and they’re the ones I will tell you how to make today. Preheat oven to 300F. Line 2 baking sheets with parchment paper. Fit pastry bag or a ziplock bag with around 1/2 inch tip. Set aside. In a bowl of food processor combine powdered sugar, desiccated coconut, and almond flour. Process for 3-4 minutes, until completely powdered, stopping to scrape the contents from the bottom. In a thoroughly cleaned bowl of a mixer, fitted with whip attachment, whip egg whites with a pinch of salt until slightly frothy. Sift in the nut mixture into the meringue. With a quick swirling motion, quickly make 4-5 stirs with a spatula, then gently continue folding the mixture until the batter falls off the spoon in a ribbon, which disappears within thirty seconds. Spoon the mixture into the prepared pastry bag and pipe 1-inch rounds on the parchment paper, 1.5 inches away from each other. Take the sheet and rap it against the counter for about 4-5 times, or if there’s a small tip left at the top of the macaron from piping, keep rapping against the counter until it disappears. Quickly sprinkle the still tacky macarons with desiccated coconut. Slide off the parchment paper onto the counter and allow the macarons to cool completely before removing. Make White Chocolate Ganache for the Macarons "Rafaello"
Pour heated heavy cream over chopped white chocolate. Allow to sit for 2-3 minutes undisturbed. The heat from the cream will start to melt the chocolate. With the spoon, slowly stir white chocolate and cream until smooth. Allow to sit uncovered at room temperature until firm. Transfer to a ziplock bag with a snipped end or use a spoon to fill macarons. Pair macarons by size. Pipe a dollop of filling onto one shell, pressing together with the other shell. Best eaten once the macarons have been allowed to sit at room temperature for 12-24 hours. Basic Macarons Recipe - Italian Meringue Method - Let the Baking Begin! Hi Olga, I’m sorry you feel that this is a bad recipe. 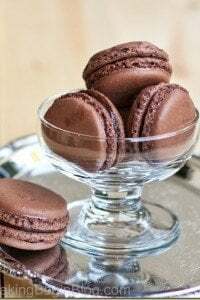 As far as remaking my own recipes, this recipe is the only one I use for macarons, and the proportions are the same as any other recipes you see on my blog (for macarons), which you can find under “macarons“. I have also taught a class on how to make macrons using this recipe, with 30 people attending, so I am quite sure in this recipe. As evidenced by the pictures of this recipe and others, the recipe works, but as I already mentioned in the comments above, with macaron batter the idea is that its thick in the beginning and as you fold it it thins out, if it didn’t, my macarons would not work and you would not see them look proper on my pictures. If you add half a cup of liquid (which is what 100 grams of egg whites is approximately) to 1 cup of sugar and one cup of nuts, the liquid in the egg whites will melt the sugar and make the whole thing runny like soup. To prevent the super runniness, you whip the egg whites and then control the thickness by folding it to proper consistency. So if you continued to fold them, they would eventually get there. Strawberry Marshmallow (Zefir) & Babyshower Dessert Table Let the Baking Begin! Batter was to thick and never thinned out. I give up. These sound delicious and the little peach fuzz from the coconut is so adorable! I’m having a macaron link party on my blog this month and I’d be delighted if you could join and share these macarons. Hope to see you there! The kind I use is the kind you see the link to below the post. I have bought it from Bob’s Mill and it’s just very fine shreads of coconut, also I bought the same kind in bulk section somewhere else (I can’t remember where) where it was the same kind (tiny shreds) but it was called coconut flour. The batter does start out very thick but as you keep folding the batter thins out. I know what you’re talking about when you say your arm hurt as it does take some elbow grease to get these folded to the right consistency. What exactly didn’t work for you in this recipe? What kind of coconut flour did you use? Hello! How many macarons does this recipe make? Also, is it okay to double the recipe and still get good results? It depends on the size, but it’s between 20-30, if they range in size from 1.5 to 2 inches big. I like Macarons – and Rafaello candies. I bet these are delicious :). Great photos as usual. Wow those look so good! I love making macarons more then eating them. Still wAiting to find time to make the lemon ones. And now these!! Thank you for another great recipe! I really wish for recipes like this you would have step-by-step pictures. The cookies look beautiful but I do not think I will be making since I failed on macaroons before! Thank you for the recipe though!